There are those who say that magic does not exist and that reality lies entirely within scientific and logical formulas. There is gravity, electromagnetism, thermodynamics and all the other laws written in the Physics manuals. There exists, more generally, the law of cause and effect. There are the laws of medicine, chemistry, mathematics and all the visions of the world that derive from them. But without the law of correspondence, the principle of abundance, and the creative power of the word, synchronicity would not exist. All the cultures that have based their worldview on a system of meanings that links man to the universe through his thought and his power, would be wrong. All the researchers who have achieved results by exploring the possibility of creating results without starting from apparent causes, they would have been wrong or, simply, they would have only been considered lucky. That between science and magic is not truly condsidered dualism, because if the former denies the existence of the latter, the latter does not deny the existence of the former; it simply explains that these laws also exist, which combine with the scientific ones to create the universe. Thus, magic is more inclusive. But what do we mean when we talk about magic? For the Damanhurians, this is not something supernatural or “magical”. Since the beginning of the history of Damanhur, Falco Tarassaco explained that magic is a set of natural laws that are not conveyed by physical or chemical elements. Telepathy is no more extraordinary than boiling water, recalling synchronic events is no more incredible than measuring the weight of something; at most, they are less frequent phenomena, but both refer to the faculties of the human being. Even ritual ceremonies refer to processes that are not so distant from the most obvious ones. When we walk back and forth in the middle of a meadow, gradually we create a path, which becomes a stable element along which everyone walks, deepening it. A ritual is not so different. 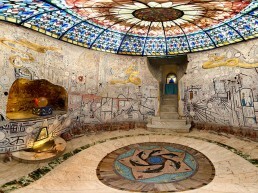 For example, the Solstices and the Equinoxes that are celebrated in Damanhur, public ceremonies that anyone can attend. The repetition year after year of the same gestures and of the same formulas create, little by little, an energetic message that recalls the events of which have previously been celebrated. 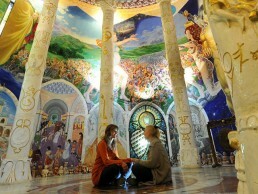 Some time ago, an Italian journalist criticized an article that spoke of Damanhur writing “ magic exists for those who believe in it“. From his point of view, in all likelihood he politely intended to make fun of the Damanhurians, referring everything to suggestion, to gullibility. Instead, without realizing it, he had written a sacrosanct reality: the most important ingredient of magic is subjective participation. The sound of the sacred syllable OM, and the sound of the Damanhurian MOAE, release strength and energy because the singer is deeply convinced of their effectiveness. The same sounds sung by those who are not aware of it, express much less. This is the reason why those who believe always find confirmation and those who do not believe, they do too. Believing in it is not an act of faith towards something infinitely distant. If anything, it is an act of humility, a form of enlarged vision that makes us aware of how the limits of the world are more distant than we often think. Leonardo da Vinci would not have been frightened by the idea of ​​cybernetics. Why do we get scared when faced with the idea that nature is still to be explored?